Utila is a beautiful island only 29 km from the port of La Ceiba. It is only 11 kilometres long and 4 kilometres at its widest point. The island is surrounded by amazing coral reefs and is considered one of the least expensive places in the world to dive and has over 60 different dive site. This small and charming island, with only around 2,500 permanent residents, is great to place to relax if your on a budget and is wonderful place to learn how to dive. Eastern Harbor is the main town on the island and home to the dock. Diving is very popular and dive sites are scattered around the island. Hiking explore some of the low level volcanoes. Beeches in some cases are the major roads. Although Utila is a great place to enjoy the beaches and watersports, the weather is not always that nice. October to February is rainy season, with a smaller rainy season in June and July. Temperatures are between 25 °C and 30 °C most of the year, but some nights can be cool with temperatures dropping to around 15 °C in January. The small airport has regular service with Aerolineas SOSA and Atlantic Airlines, with connections to Roatan and San Pedro Sula, which have international connections. The Utila Princess makes two trips a day to and from La Ceiba to Utila. It tatkes around 1 hour and costs US$21 one-way. It departs from La Ceiba at 9:30am and 4:00pm and from Utila at 6:20am and 2:00pm. You can connect by ferry or private boat to Roatan on a regular basis. Rent the islands of Sandy Cay or Little Cay for as little as a $100 a night. 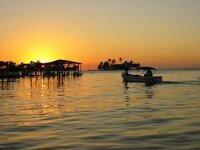 We have a comprehensive list of accommodation in Utila searchable right here on Travellerspoint. You can use our map to quickly compare budget, mid-range or top of the range accommodation in Utila and areas nearby. This is version 9. Last edited at 3:22 on Aug 2, 17 by sleepBot. 3 articles link to this page.